From large commercial projects to custom siding, shelving, slabs, or mantels, The Lumber Baron has a huge selection of reclaimed redwood, fir, cedar, and hardwoods to choose from. Heartwood versus Sapwood Know the Difference! Let's face it, good redwood is hard to find. But redwood is suppose to be red. With 5 different all heart grades, 28 different stocked items, and 41 years of buying experience you'll be blown away by the selection and quality found at our yard. nown for quality Redwood Lumber since 1978, The Lumber Baron, Inc. has expanded its inventory to include a full line of Western Red Cedar and a large selection of Reclaimed Lumber. 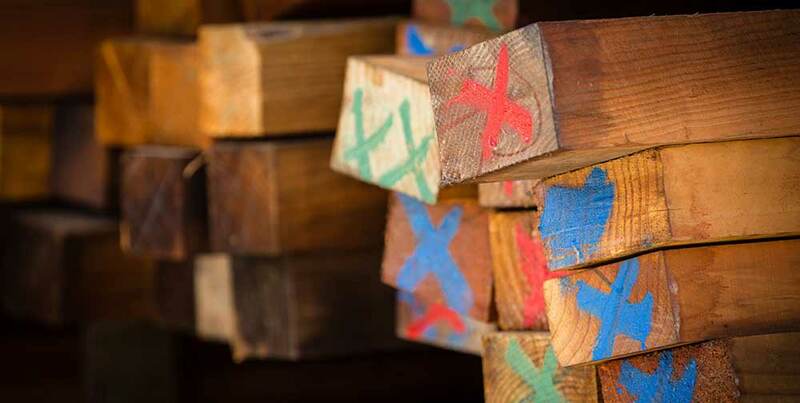 Having developed special relationships with the best redwood mills around, we are still committed to offering our customers the highest quality, widest selection, and lowest prices on new redwood lumber in the Bay Area and beyond. However, with a new 3.5 acre site in the works, complete with inside storage, an expanded milling operation, a show room and a vast hardware selection, we feel now is the perfect time to incorporate these new products lines in the same large selection, high quality fashion you have come to expect from us. With an expected completion date of late summer 2019, our new location on Harbour Way South in Richmond, will be the new home to our complete line of #2 clear, Old Growth Vertical Grain Western Red Cedar Lumber. Additionally, the new location will house our already expanded Reclaimed Lumber selection, freeing up much needed space at 500 Cleveland Ave yard. Aside from the Reclaimed Redwood Lumber we have carried for years, The Lumber Baron now carries Reclaimed Douglas Fir and Reclaimed Mixed Hardwoods. We have acquired some special historical lumber from locations such as the Bay Bridge, Hangar One on Moffett Field, and flooring from the Naval Base on Mare Island. Check out our products page for a full list of materials and descriptions, both new and old. Family owned and operated since 1978, The Lumber Baron would like to thank you for your continued support over the last 41 years. We realize this expansion would not be possible without you and hope the new lumber products and hardware selection will make your shopping experience with us more enjoyable. No plastic stuff here. The Lumber Baron carries a vast selection of natural redwood, cedar and reclaimed lumber. The Lumber Baron prides itself on stocking superior products, whether it be the loftiest architectural application or the most economical fence or deck project. At The Lumber Baron we believe there is no comparison to the warmth and beauty of natural wood. Got Reclaimed Wood? WE DO! It’s the least expensive in the long run. Too often contractors and owners try to cut corners by using, cheap inferior materials only to see the same issues resurfacing a short time later. Stay away from Sapwood, finger jointed siding and thin, flimsy fence boards. To aid in your green building needs, The Lumber Baron has a vast selection of reclaimed lumber. FSC redwood or cedar is also available by special order for your LEED or other green building projects. We are happy to mill our lumber for you. Whether it be a rare or common siding pattern, surfacing, or desired re-saw marks, we can handle it, often in a fraction of the time other yards take to perform the same service. A new 3.5 acre site is in the works, complete with inside storage, an expanded milling operation, a show room and a vast hardware selection. We look forward to expanding our current product lines as well as offering a host of new ones and will keep you posted as the site progresses. The Lumber Baron would like to thank you for your continued support over the last 40 years. We realize this expansion would not be possible without you and hope the new lumber products and hardware selection will make your shopping experience with us more enjoyable.